Gladys P. Santana brings a fresh, dynamic approach to working with clients whose lives have been tragically altered by defective products, workplace injuries and automobile accidents by representing clients on a personal level. 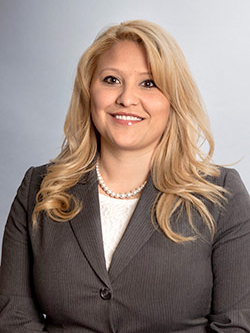 Prior to joining the firm as an associate, Gladys worked as a supervised, certified, senior law student at the Kane County State’s Attorney’s Office. In this role, Gladys honed her litigation skills by prosecuting misdemeanor and felony crimes while serving as second chair in various bench and jury trials. She participated in all phases of trial proceedings, by performing case management and also researching and drafting legal memoranda in preparation for trial and sentencing. Gladys attended Northern Illinois University College of Law, where she was an external Moot Court Team competitor. As a competitor, she prepared an appellate brief and presented oral arguments to a panel of judges and lawyers from all over the country. While in law school, she worked as a supervised, certified, senior law student at the Zeke Giorgi Legal Clinic, where she worked on various domestic abuse and family law issues. Her experience while working closely with victims of domestic abuse cultivated the desire to use advocacy as a tool to help make victims whole again and has since been the driving force behind her career path. Gladys is licensed to practice law in the State of Illinois. She is a member of the Kane County Bar Association, DuPage County Bar Association, Illinois State Bar Association, and the American Association for Justice. Gladys is fluent in Spanish.